Hard bumps on the face are unsightly and can cause a sense of embarrassment. These bumps are raised, visible and very difficult to conceal with makeup. Some hard bumps can represent a potentially serious cause and must be treated. Knowing what causes hard facial bumps and what treatment options are available is important. Acne is the most common source of hard bumps on the face. In fact, over 80% of teenagers will suffer some degree of acne. Both acne nodules and acne cysts produce visible hard bumps on the face. 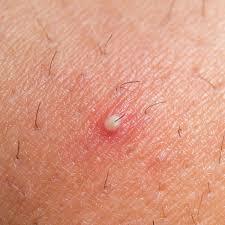 A nodule extends below the surface of the skin and is palpable. An acne cyst is larger in size and filled with debris from the dead skin cells, oil and pus. Both types of acne bumps can be painful and you should resist the temptation to squeeze or pop them. Acne causes irritation and inflammation of the skin. Common areas affected are the face, particularly the forehead, around the nose and the chin area. The upper back and chest are frequently affected as well. Home Remedies: The best course of action for prevention is to gently wash the face no more than twice a day and always use mild cleansers and soaps. Do not scrub the skin as this just causes more irritation. Very mild cases can be improved by using over-the-counter products such as salicylic acid or benzoyl peroxide. 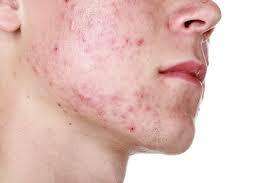 Medical Treatment: Despite proper treatment, acne can cause scarring. Over-the-counter treatments may help, but seeing your doctor or a dermatologist before scarring develops is the best course of action. Prescription creams, antibiotics and other treatments are more effective at preventing or dealing with scarring once it develops. The proper terminology for a sebaceous cyst is epidermoid cyst. These cysts occur on the face, neck, back, trunk and also genital region. They are visible and have a domed appearance. These cysts contain cells from the outer layer of skin and an oily material called sebum. Unless epidermoid cysts become inflamed or infected, most people do not experience any pain. Medical Treatment: Treating sebaceous and epidermoid cysts is straightforward. Medical care is the best solution for treating these cysts. The doctor can sterilize the area and permanently remove the cyst using a variety of techniques. Home Remedies: Try using a hot water bottle, heating pad or warm compress twice a day for a minimum of 10 days. This opens the pores over the cyst, encourages blood flow to the area and helps the oily sebum to drain from the cyst. Gentle pressure on either side may help dislodge and expel the waxy appearing material, but resist the temptation to press too hard. This can result in bruising, damage to the surrounding skin and tissue and infection. Hair is produced in follicles below the surface of the skin. Occasionally the hair does not make it out of the skin pore and is trapped underneath the surface of the skin. In this case, a hard bump appears on the face. Those with curly hair types are more prone to this problem. After shaving the curly hair is sharper and can curl back and pierce the skin becoming trapped. The body views the hair as a foreign invader and attacks it. The result is inflammation and a hard bump under the skin. These bumps can become painful and drain pus. They are common on the face and often appear in other areas due to shaving or excessive irritation of the skin due to friction or clothing. Proper Skin Care: Treating ingrown hairs starts with gently cleaning the area using a mild soap. A Loofa or washcloth can be used to gently scrub the area to release the trapped hair. This exfoliating action removes dead skin and prevents pores from clogging and ingrown hairs from developing. Your doctor may prescribe steroid creams or Retin A to help remove dead skin cells that can result in clogged pores, acne and ingrown hairs. If an infection develops, an antibiotic may be needed. Proper shaving technique can help. Always wet the face with warm water before starting and use a sharp single-bladed razor. Use as few passes with the razor as possible and shave consistently in the same direction as the hair grows. Rinse the razor after every stroke to keep the small hair pieces on the razor from poking into the skin. A lubricant shaving lotion or gel is the best choice. Apply a cool washcloth after shaving to reduce irritation. Clogged pores result in the formation of milia. These hard small whitehead-type cysts appear just under the skin. There is a hereditary component to milia, but no one knows exactly why they form. How to Treat: Milia are not painful nor do they generally produce pus. Treatment can include home remedies or a visit to your doctor. If the milia are located in the thin skin of the eyelid, a small tweezers can be used to squeeze the milia while pulling the skin away from the eye. How to Remove the Bump: Break open the milia by pulling a small piece of skin off creating an opening. Now squeeze the contents of the milia out and the bump will go away. Larger milia on other parts of the face with thicker skin require a different approach. First clean the area with an alcohol swab. Then sterilize a safety pin with another alcohol swab. Now gently poke a hole into the milia area but do not go more than just a few mm deep. Now press on either side of the milia with your fingernails and this will cause the contents to be expelled. A small amount of bleeding may occur and be sure to swab the area again to cleanse and sterilize the broken open skin. A dangerous and potentially life threatening allergic reaction can result in the rapid appearance of facial bumps. Anaphylaxis is the medical term for a severe allergic reaction and it causes facial bumps, hives on the body, lip and tongue swelling, difficulty breathing and collapse of the circulatory system. Without immediate medical care, this condition can result in death. How to Treat: The environment is packed with allergens and irritants. 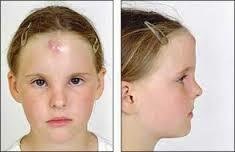 Children and adults commonly develop skin bumps as a result. Allergic reactions also develop when our skin is exposed to foreign substances that trigger the body’s immune system to attack itself. Avoid anything that triggers a reaction from the immune system. Often a visit to a dermatologist is needed to determine the exact cause. Skin cancer is a common type of malignancy and several types can occur. Hard bumps on the face can be a sign of skin cancer. Basal cell carcinoma often starts as a small hard bump with a domed appearance. It grows slowly and does not cause any pain. Risk factors include advancing age and sun exposure. Occassionally small blood vessels can be seen passing over these cancerous growths. Your doctor or dermatologist will be able to tell of a hard bump is cancerous based on appearance or taking a biopsy for further analysis.